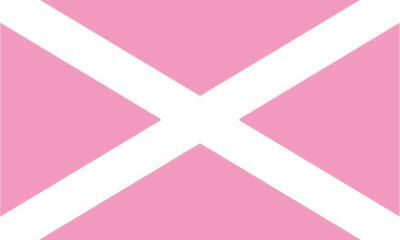 Shetland LGBTQ is an independent local community group. 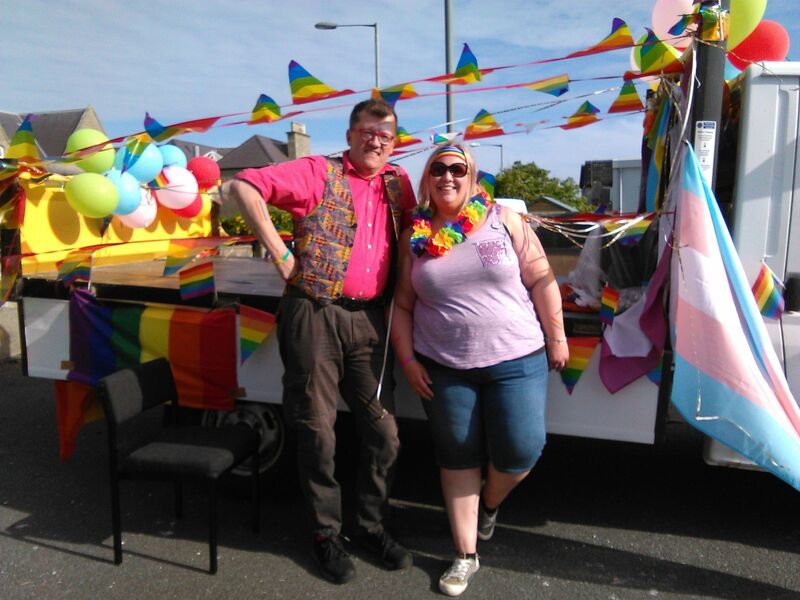 It’s run by a small number of dedicated LGBTQ individuals in order to help and support both Lesbian, Gay, Bisexual and Transgender individuals and couples, including supporting the families and friends of all LGBTQ folk throughout our islands. 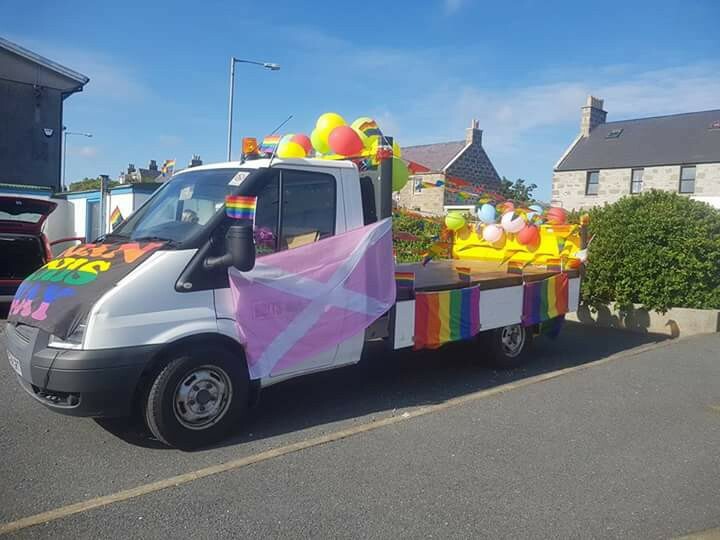 The original LGBT group on Shetland has been active for many years on Facebook and continues to attract a small number of individuals who meet at Mareel Centre in Lerwick usually once a month. 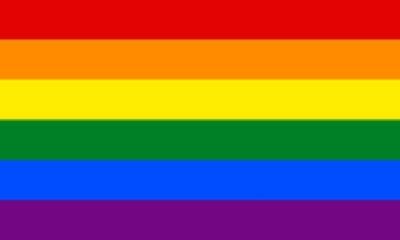 As an independent community group our aim and focus is to support and help all LGBTQ people on Shetland. We feel it’s highly important to the mental health and wellbeing of individuals they are offered a safe, secure and friendly environment where they can feel at ease socialising with other like-minded folk. With this is mind, we have regular monthly social get-togethers at Shetland Link-Up, 8 Commercial Street, Lerwick. These secluded premises offer easy access and excellent facilities, including the anonymity and privacy many individuals might prefer should they decide to “come out” away from family and friends. 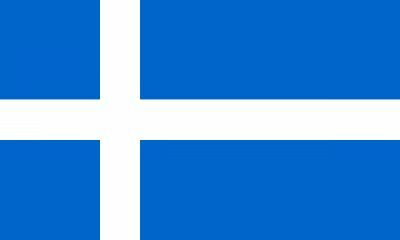 We are also planning Out-Reach meetings in various parts of the island from Unst to Dunrossness in order to help and support those in outlying areas. One in 50 people in UK now say they are either Lesbian, Gay or Bisexual. 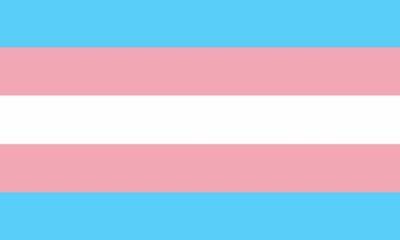 The number of Transgender people in the UK is now estimated at 1 in 500 people or 0.2% of the population. 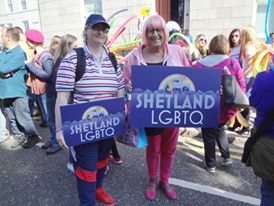 On Shetland it can be estimated there must be hundreds of individuals who identify themselves as either Lesbian, Gay, Bisexual and up to fifty who may well be Transgender. However, because of work or close island family ties or for other reasons, many are denying their true feelings and aspirations. This denial can lead to family break-ups, serious mental issues and sadly in some cases, even suicide. We have approached several local health professionals who are willing to counsel those who require specialist advice and support. Over the past 25 years, Britain has taken huge strides on the journey towards equality for Lesbian, Gay, Bisexual and Transgender people. Changes in the law mean that more schools, employers and public services are tackling anti-LGBTQ discrimination and bullying. But for many LGBTQ people these legal changes have not always translated into true equality, and for transgender people in particular there is still much progress to be made before they are fully protected and equal under the law. Many LGBTQ folk are both fearful and apprehensive about possible bigitory and hate crime. Fortunately, with an already low crime rate, Shetlanders are far more tolerant and passive towards us as a group than in many other parts of the UK. Regardless, we understand your fears and that’s why we’re here to help and support you. 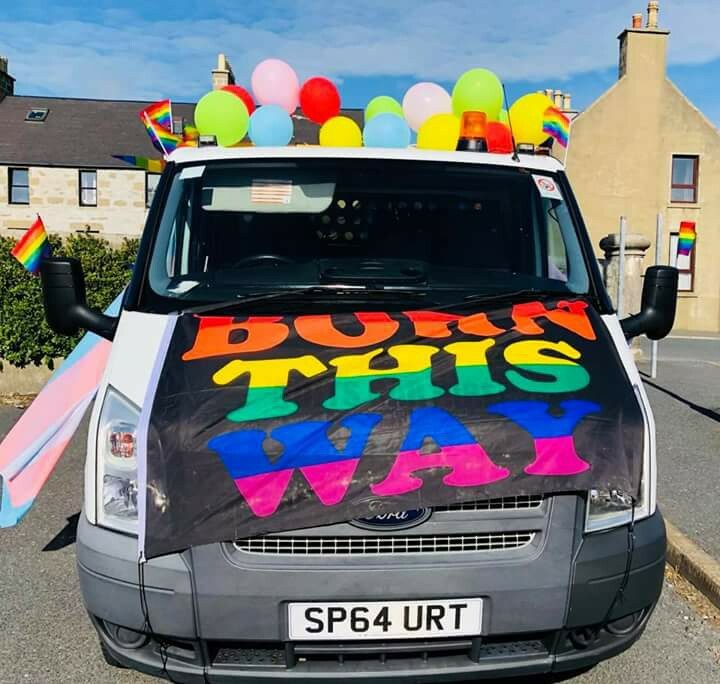 Conveniently located in a secluded location in Lerwick with a private entrance, you can meet, socialise and chat with like-minded LGBTQ people within a secure environment at monthly get-togethers for a chat over a tea or coffee, play pool, darts or use the facilities computer. Existing members and new LGBTQ folk welcome. Refreshments, tea, coffee and nibbles. £3.00 per person contribution appreciated! For those individuals who find it either impossible or inconvenient to travel to Lerwick, we are planning to create Out-Reach facilities where you’ll be able to meet us for a chat, have refreshments and socialise with other like-minded individuals in a congenial environment. Our 2018 Carnival Float was a huge success. If you’re adventurous and confident about yourself, why not help and even join our Carnival float in 2019? 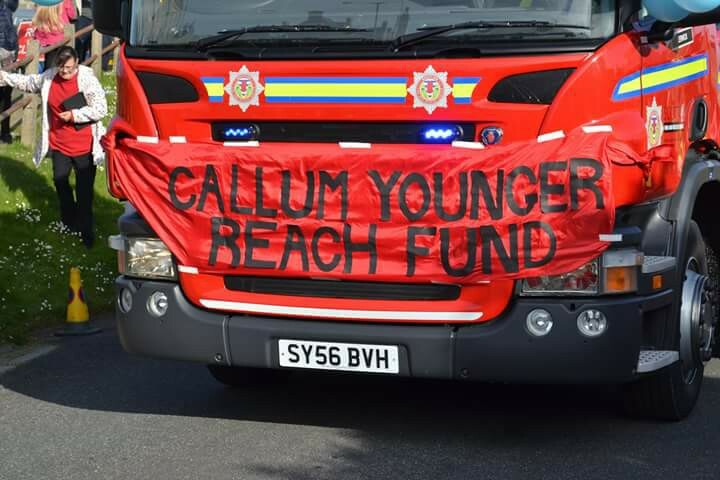 It’s also a great opportunity to promote Shetland LGBTQ and raise money for the Callum Younger Reach Fund. Contact us if you'd like to help or participate! After the Grampian Pride parade down Union Street, most of the participants assembled at The Pride Village that was a pleasant a 20 minute walk away. The crowds were heaving as the bands started playing. 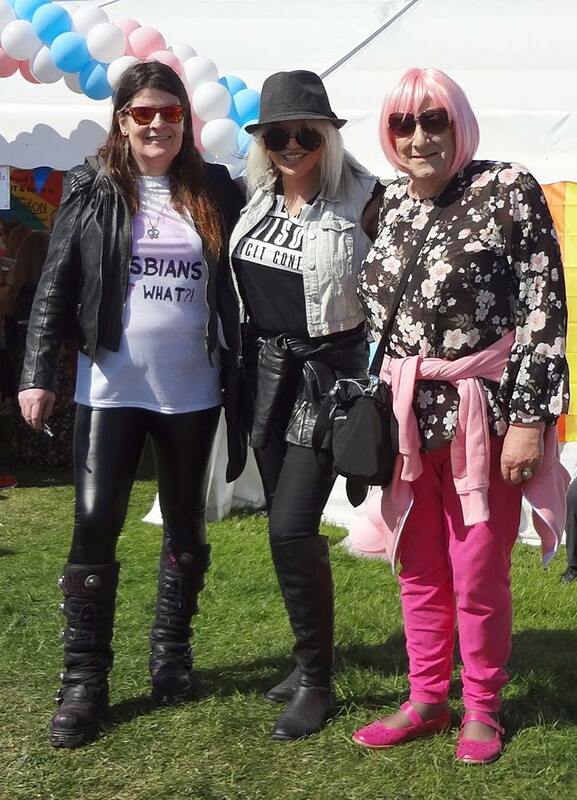 Meeting Facebook friends at Grampian Pride for the very first time was one of the highlights of our visit to Pride Village! Vikki and I met Michelle Johnson on the left and her well known (if not famous!) friend – the one and only Jennie Robertson in the middle. Such a character and a real sweetheart! Everyone on the ferry back and forth from Shetland and literally everyone we met in Aberdeen and at the Premier Inn was great. In fact, there was absolutely no problems at all for any LGBTQ folk. We had such lovely time and met so many nice people! Can’t wait for 2019! LGBTQ Sponsors and Supporters Welcome!